We are researching advanced transportation systems that lead to safer and more economical solutions. Several faculty are researching transportation efficiency, including exploring new battery systems in hybrid and electric vehicles. 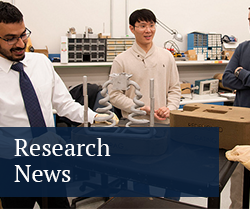 Other faculty are working on projects to improve vehicle safety, crash and rollover dynamics, and robotics. Some of our faculty have affiliations with the Thomas D. Larson Pennsylvania Transportation Institute, which studies transportation infrastructure and operations, systems and safety, bus transport, and travel terrain.